Grammy Award nominee, four times International Dance Music Award winner, four times DJ Mag Award winner, frequent cover star, acclaimed live artist, SASHA is a man who needs no introduction. His already prosperous career is burgeoning exponentially, as is the range of his achievements: mixing fabric 99; tracks released on Kompakt and Watergate; his superb Scene Delete compilation (Late Night Tales); record sell-out REFRACTED live shows; legendary All Night Long sets, world tours and sold out label showcases. The ultimate timeless artist, Sasha is still enlisting new fans worldwide and appealing to each coming generation. 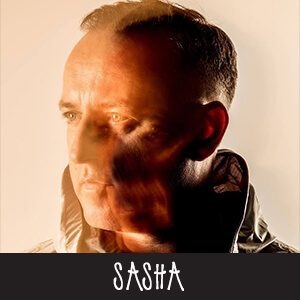 Last year in particular Sasha enjoyed the hard-earned luxury of musical exploration, rewarded by consummate success and the invitation to helm ‘fabric 99’, gathering exceptional reviews and selection as a Mixmag compilation of the year. Further, his LNOE collaboration with La Fleur, ‘Förbindelse’, became a Radio 1 Essential New Tune and resulted in them joining forces in the kitchen for Native Instruments’ Traktor Cookery at ADE 2018. Since 2011, he’s carved out a new path for his celebrated Last Night On Earth imprint. Currently in its eighth year, LNOE is a key platform for fresh, inspiring talent, including Cristoph, BAILE, John Monkman and VONDA7, while showcasing highly respected and long-established figures such as Maribou State, Max Cooper, Fur Coat, Ejeca and more. February 2019 marks a milestone of 100 releases with their debut collaboration, LNOE100; 11 tracks selected by Sasha’s invited guest remixers. In Sasha’s REFRACTED:LIVE shows, he performs live, accompanied by strings, live vocals and guest musicians. Material includes his Scene Delete album and seminal tracks from his back catalogue re-imagined as an original score, alongside new material composed with the live setting in mind. The overwhelming response of 2017’s debut two-night sellout show at London’s Barbican led to three more live tour dates for last year. Again, tickets sold out a mere hours after general release for two shows at London’s Roundhouse and one at Bridgewater Hall (Manchester). With such a phenomenal reception so far and extensive international interest, this is only the beginning for Sasha’s live performances.